This is one of the more famous of all Chinese Deities. Some give him titles like "Vanquisher of Demons", "King of the Ghosts of Hell" or simply "Ghost Warrior". 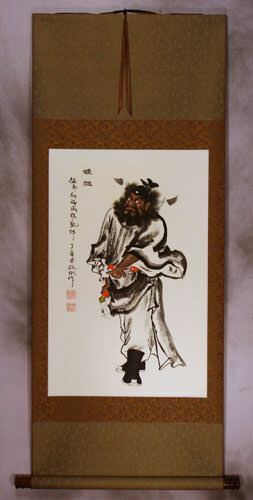 Images of Zhong Kui were traditionally painted on the courtyard gates of homes. Though this practice has faded in history with the advent of the urban apartment. 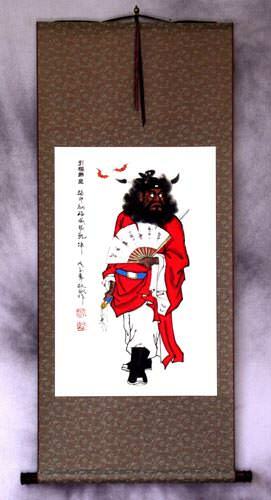 Still, you will see paintings of this mythical character in people's homes as a guardian spirit. 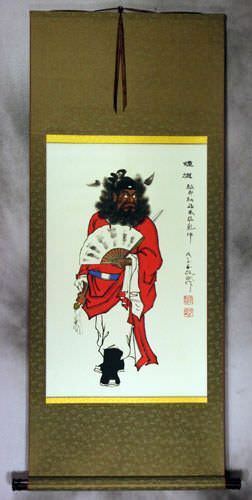 According to the myth, Zhong Kui travelled with his close friend, Du Ping to take imperial examinations at the capital. Zhong Kui achieved top honors in the exams, but was stopped from taking the title earned after the emperor saw how truly ugly Zhong Kui was. In protest, Zhong Kui committed suicide upon the palace steps by crushing his own skull against the palace gate. Zhong Kui's close friend, Du Ping personally buried him. After Zhong Kui became king of ghosts, he returned from hell to the living earth on Chinese New Year's Eve. 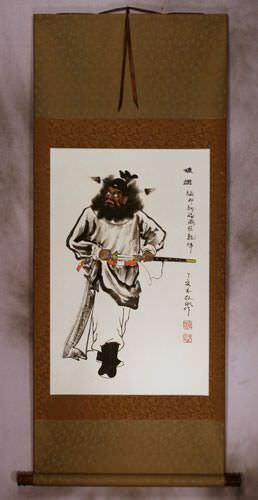 To repay Du Ping's kindness and friendship, Zhong Kui gave his sister in marriage to Du Ping. Later, during the reign of Emperor Xuanzong, (the sixth emperor of the Tang Dynasty 712 to 756 AD), the Emperor fell ill. He had a dream in which he saw an evil ghost. The ghost was stealing from the emperor (symbolically stealing his soul). A powerful ghost suddenly appeared and smited the evil ghost, then introduced himself as Zhong Kui. He said that he had sworn to rid the empire of evil. 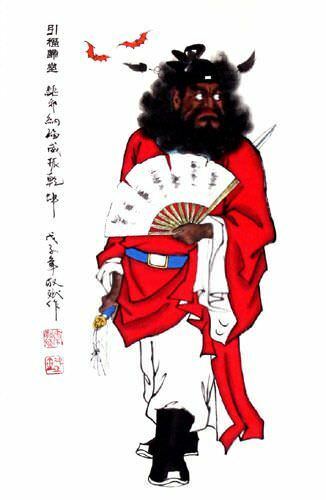 From this episode in Chinese mythology / history, Zhong Kui became a famous figure of protection from evil.